Is a focused, all-in Visteon now stable? DETROIT -- When Tim Leuliette steps down as CEO of Visteon Corp. late this year, he will leave behind a company working in just one major product sector: cockpit electronics. That's a radical change for Ford Motor Co.'s former in-house parts division, which had a vast, disjointed product portfolio. When Visteon was spun off in 2000, the company made glass, climate control modules, bumpers, fuel tanks, axles, steering components, in-vehicle entertainment, navigation systems, headlights and powertrain cooling systems. Now, the company produces instrument clusters, infotainment displays, vehicle security systems -- and the software needed to run these products. Lots and lots of software. And that, in fact, is where the money is these days. During a Jan. 5 interview with Automotive News, Leuliette said half of Visteon's 4,000 engineers are software developers. To underline that expertise, Visteon showcased its reconfigurable instrument clusters in January at International CES in Las Vegas. Car owners can create a new look for their speedometer and tachometer by downloading a software upgrade. That's a long way from the old Visteon's glass, bumpers and fuel tanks. At International CES, Visteon also touted its ability to integrate a vehicle's instrument cluster, center console and head-up display into one harmonious package. Automakers value that kind of expertise, said Mike Robinet, managing director of IHS Automotive. Integration of a vehicle's displays "is the secret sauce of this market," Robinet said. "It's really critical to integrate the hardware with the software." It's not as if Leuliette suddenly woke up one morning and decided to focus on infotainment. As far back as 2001, Visteon marketed rear-seat entertainment, audio systems and Bluetooth linkups for MP3 audio players. And when the company was in bankruptcy in 2010, Visteon spurned a bid by Johnson Controls to buy its electronics and interiors units for $1.25 billion. When Leuliette was named CEO in 2012, restive investors believed Visteon was moving too slowly to narrow its product lineup -- a key reason for former CEO Don Stebbins' abrupt departure. So Visteon sold the interiors unit in 2014, followed by the climate control division, a $3.6 billion deal, early this year. Meanwhile, Leuliette has been expanding Visteon's electronics division. In 2014, he purchased Johnson Controls' electronics operation -- which produced instrument clusters, head-up display units, infotainment displays and body electronics -- for $265 million. With a sole focus on cockpit electronics, Leuliette has put all of Visteon's eggs in one basket -- but it looks like a sturdy basket. The 2015 revenue of the slimmed down company will be about $3.3 billion -- less than half of its 2013 total, the company says. The Johnson Controls acquisition has given Visteon enough scale to compete. In his Jan. 5 interview, Leuliette said Visteon is the top global supplier of instrument clusters, and is No. 3 in cockpit electronics, behind Continental AG and Denso. Visteon and its top rivals are positioned to claim a substantial chunk of a promising growth market. Over the next five years or so, North America's infotainment market is likely to grow 10 percent annually, predicts Praveen Chandrasekar, an analyst with Frost & Sullivan, a consulting firm in Mountain View, Calif.
"By 2020, infotainment is going to be a no-brainer," Chandrasekar said. "The Tier 1 suppliers will be the enablers in this game." Chandrasekar estimates that hardware will account for 60 percent of the segment's revenue, with software generating the rest. Which explains why software plays such a big role within Visteon. "It's pretty obvious that everything in the vehicle will be software-enabled," Chandrasekar said. Visteon and other suppliers may find themselves outflanked by Google and Apple, as vehicles grow more dependent on the cloud for data, apps and services, Chandrasekar cautions. But during his Feb. 26 earnings call with industry analysts, Leuliette noted that Visteon's electronics unit lined up $1.3 billion in new contracts and renewed business last year. 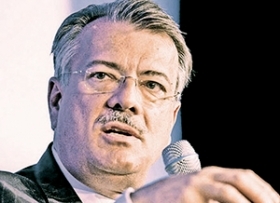 Leuliette, who announced on March 16 that he would step down when Visteon appoints his successor, can argue that the company's future is secure. "We're happy with the business we've got," Leuliette said. "We're happy with the order book we've got. And we're happy with the business backlog. We've got a lot to execute in 2015, so that's [our] primary focus."